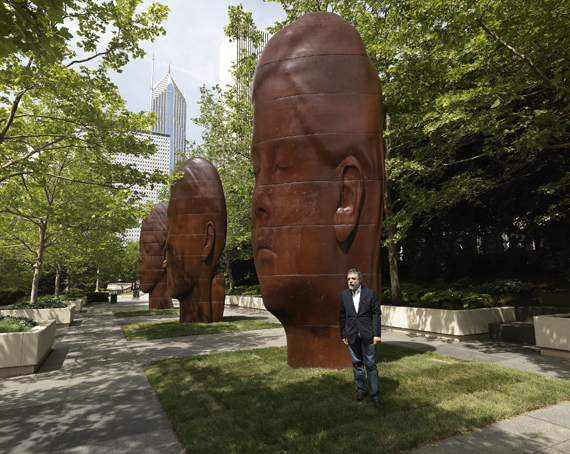 Jaume Plensa, the Spanish sculptor, added another four sculptural "portraits" to Chicago's growing Public Art in the parks. Ten years ago, Plensa, born in 1955, created the globally famous "Crown Fountain" which has become a Chicago landmark and a public sculpture Icon. The four new Plensa pieces are all modeled after young girls on the cusp of womanhood. Plensa titled the new works placed in Millennium Park "1,004 Portraits", since in his own words he merely added four new images to the 1,000 faces already depicted in his two tall video sculptures known as the "Crown Fountain". "Look into My Dreams, Awilda" by Jaume Plensa in Millennium Park, Chicago, IL. Courtesy of the Richard Gray Gallery. Both Crown Fountain video towers are live-action and kinetic with images of everyday Chicagoans; not the elite Chicago personages typically responsible for the addition of such artwork to the city's landscape. And whose names are memorialized throughout Millennium Park as Directional Landmarks. At the unveiling of his latest sculptures, set amongst Chicago's many architectural towers but planted on the grassy foundations of Millennium Park, Plensa confided to me that his "Crown Fountain" when it was first created was intended to be a very serious salute to the citizenry of Chicago and a welcome addition to the Millennium Park landscape whilst incorporating sounds of water with the constant changing seasonal imagery. What happened instead is what happens in many parks, the children began to splash in the fountain and play. So now as we spoke 10 years later, children were happily splashing in the fountain between the two video sculpture towers, playing in the waters, and becoming a part of Plensa's living sculpture. Indeed, the children humanized his Crown Fountain Video Towers into something playful and added a participatory element. Even as Plensa spoke about his new installation, he had to speak above the gleeful noises of the kids and the water sounds. The first new sculpture, "Look Into My Dreams, Awilda" is made of a white resin and stands 39 feet tall. The work is at once both surreal and portrait-like with the elongation of features such as in a Modigliani painting. The piece has a power that is echoed by its three sculpture sisters "Laura," "Paula," and "Inez" cast in iron and now installed in the adjacent outdoor South Boeing Gallery. The installation of the works, which are on loan from the artist until December 2015, is co-presented by the Millennium Park Foundation with the Chicago Department of Cultural Affairs and Special Events and sponsored by the Boeing Company with support from the Richard H. Driehaus Foundation. The sculptor said he likes to capture the ephemeral beauty, as well as the possessive power of girls, just as they are becoming women; the Youthful Beauty of girls on the cusp of Blooming into Womanhood, a familiar subject for artists. Plensa's reputation has grown globally since he first conceived of the "Crown Fountain," turning him into one of the world's most foremost sculptors. Dubai, London, Liverpool, Nice, Tokyo, Toronto, and Vancouver now are host to the Barcelona-based artist's large public sculptures, many of them connected with water. Donna La Pietra, chair of the Millennium Park Foundation, faced Mr. Plensa at the opening ceremony and thanked him saying "we are tremendously grateful to Jaume for allowing Chicago to host these pieces. We can think of no better way to celebrate our 10th Anniversary than by hosting such an impressive array of works by one the original artists whose contributions to Millennium Park have made it a model for public spaces world-wide." Timed to coincide with the debut of Plensa's Park sculptures, the Richard Gray Gallery will exhibit "Private Dreams," 8 new sculptures from Plensa's iconic series of heads made out of materials including bronze, glass, and, for the first time, volcanic basalt. The sculptures from "Private Dreams" are collectible and all continue the artist's focus on the human figure, specifically the head. 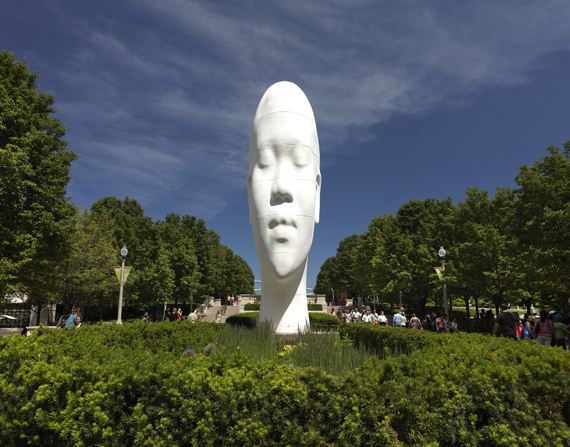 The Park's sculptures are monumental and while these tall heads range from 23 feet to 39 feet, they still somehow cohesively blend with Chicago's second-largest tourist attraction, Millennium Park. And the thousands of people who are inspired and engaged by them.